We teach all over Sydney’s Lower and Upper North Shore, from the Harbour Bridge up to Wahroonga. 21 years ago, Tanya’s Tadpoles was founded on Sydney’s North Shore, teaching kids to swim in their home swimming pools. We have since expanded to several other areas in Sydney, but the North Shore is still our heartland, and we love helping local families to teach their kids a love of the water and to improve their kids’ swimming skills. 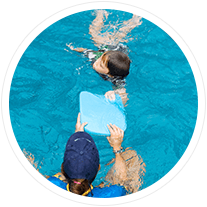 We offer swimming lessons on the North Shore for kids aged from 5 months, all the way up to squad level and we also teach adult classes. 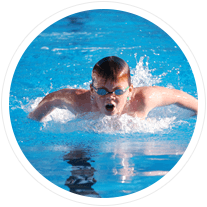 We initially teach kids independence in the water, and later we work on developing all 4 strokes and refining technique so that our swimmers are efficient swimmers, ready to swim for fun and recreation, or to swim competitively. The home environment is not only convenient for families, it helps build confidence in young swimmers who are more likely to feel relaxed at home, and there are not the distractions of a larger centre. The North Shore is home to many pools and many young families, and it is critically important that kids learn to swim in the environment where they will spend the most time swimming.